SOUTHAVEN, Miss. – Writing center directors at Northwest Mississippi Community College and the University of Mississippi at DeSoto Center – Southaven recently collaborated with eighth-grade educators at Hernando Middle School to explore how writing centers can make an impact on students at any grade level. During the last week of November, the directors gave mini-lessons on writing to encourage and inspire students at the middle school. Northwest Writing Center Director Jason Jones and Northwest Online Writing Center Director Daymon Kiliman spoke about drafting and the writing process – two skills that can be critical to both writing, as well as broader research projects. Josh Green, writing center director at Northwest DeSoto Center, and Jeanine Rauch, writing center director at the University of Mississippi – DeSoto, instructed students on the importance of audience and purpose and how description in ones’ writing is important for the reader. The writing center directors hope to initiate visits with other middle schools and high schools in the north Mississippi region, Green said. They would also encourage schools to consider implementing their own center as part of this collaboration. Writing centers offer free services that are designed to help students become stronger writers and critical thinkers. “A writing center adds so much to a school as it serves not only as a student support service, but it also models the practice of collaborative writing and revision that is critical at both the high school and college level,” Green said. 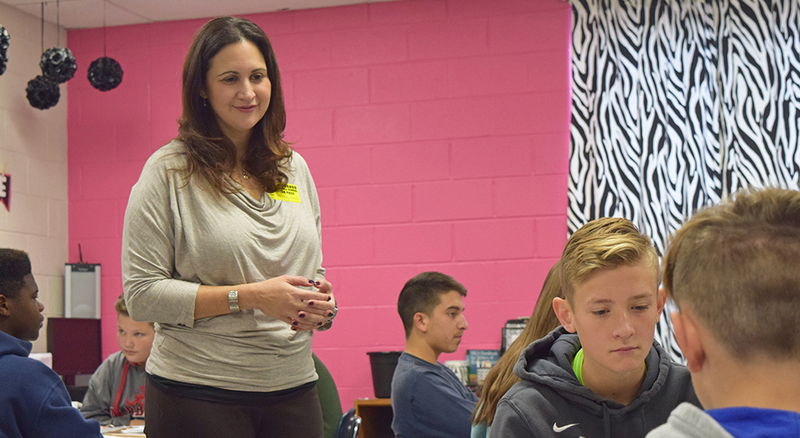 Tarra Taylor, eighth-grade English teacher at Hernando Middle School, remarked on the positivity that this type of collaboration brings to DeSoto County Schools. Jennifer Booher, also a Hernando Middle School eighth-grade English teacher, agreed that collaborating with the writing centers is valuable for her students. Rauch hopes that the collaboration will continue to grow and provide helpful resources for students and faculty at DeSoto County Schools. For more information about Northwest Mississippi Community College Writing Centers, visit northwestms.edu. For more information about the University of Mississippi – DeSoto Writing Center, visit olemiss.edu/desoto.